There are people who struggle when they have to make tough decisions. They go running through the advantages and consequences of situations and torture themselves over how to make the right call. When you’re faced with the most difficult decisions, it helps to make use of a structured decision-making strategy that’s effective when it comes to improving the quality of your decisions thereby increasing your chances of success, especially in an organization. 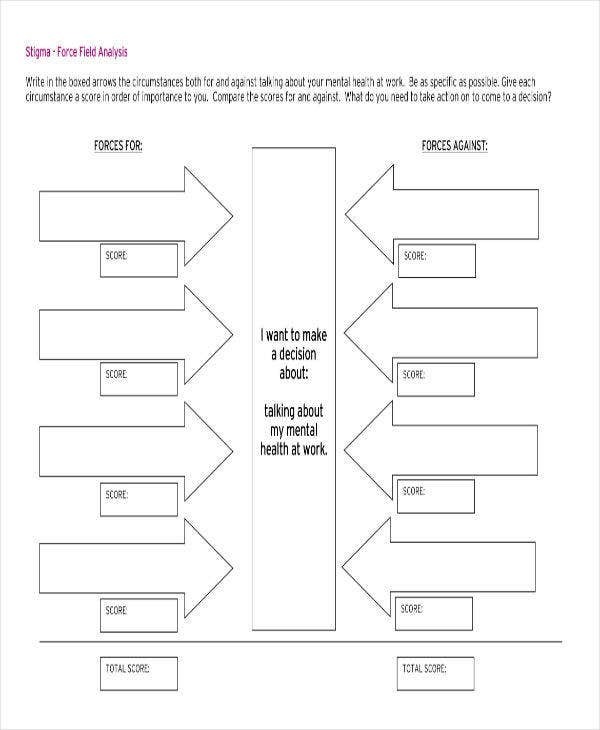 You may also see business needs analysis templates. Company leaders, an organization’s board or executives and its management team would always have to go through the toughest decisions and rarely do they get out of it gaining approval from employees or members who do not understand the bigger picture. And oftentimes making the right call doesn’t always mean doing what’s considered morally right that’s why they can use all the decision-making techniques and support they can get, to improve their strategies, especially in handling challenging situations. You can also read hazard analysis templates. Lewin’s force field analysis is one of the most popular and the most effective techniques in organizational psychology, which you can use in such situations. Lewin originally used the principle in his work as a social psychologist in the 1940’s. 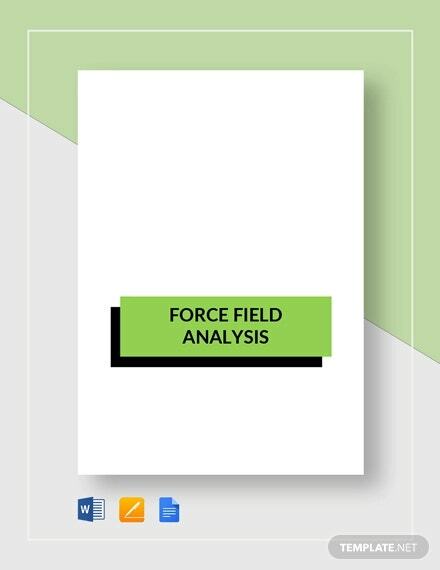 Currently, force field analysis is a very useful tool in business for making and communicating go or no-go decisions. The concept behind the analysis is that situations are maintained by an equilibrium between forces driving change and opposing forces that resisting the change. You may also see stakeholder analysis templates. For change to exist, the driving forces must therefore either be strengthened or increased or the resisting forces should be limited or weakened. This technique is useful for businessmen‘s decision-making when they are able to analyze for and against forces of change and explaining the reasoning behind the decisions made. You can also read case analysis templates. Kurt Lewin’s idea of culture is like being in a state of equilibrium where he writes in his manuscript, Resolving Social Conflicts: “A culture is not a painted picture; it is a living process, composed of countless social interactions. Like a river whose form and velocity are determined by the balance of those forces that tend to make the water flow faster, and the friction that tends to make the water flow more slowly the cultural pattern of a people at a given time is maintained by a balance of counteracting forces.” You can also read printable analysis templates. 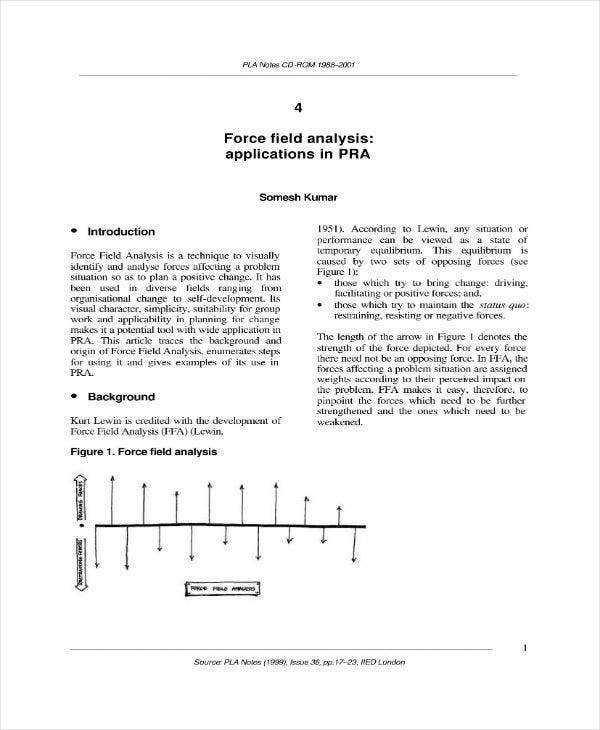 A force field analysis defined is a major development in psychology and social science. It offers framework for looking at the factors (forces) influencing a situation , originally social situations (in modern times organizational situations. It looks at forces that are either the drivers of movement towards a goal (helping forces) or blocking movement (hindering forces). Kurt Lewin developed this principle which became a very important contribution to various fields in the social sciences, psychology, social psychology, community psychology, organizational development, process management and change management. Kurt Lewin further writes, “To bring about any change, the balance between the forces which maintain the social self-regulation at a given level has to be upset.” Lewin believed that changes of what he refers to as a person’s “life space” is largely dependent upon that person’s reflection of external stimuli taken or gained from the physical and social world into the “life space”. For him, the experience alone does not cause the change in the “life space” but the acceptance of external stimuli. You may also like analysis examples. Lewin later used the same principles for group conflict analysis, applying them further into learning, adolescence, hatred, morale, German society at its most troubled times, etc. This application helped him through breaking down the most common misconceptions of the social phenomena mentioned previously. Using theory, mathematics, and believe it or not-common sense in defining a force-field thereby finding out what causes human and group behavior. You may also like sample market analysis. Before seeing change, the force field should have balance between favorable change forces and those resisting it. Lewin also indicated the existence of a quasi-stationary social equilibrium, suggesting that the status quo, which in this case, is the equilibrium, must be broken or upset either through the addition of favorable change conditions or through decreasing restraining forces. This is what’s being proposed to be used in decision-making using the theory or technique: whenever driving forces appear to be stronger than hindrance forces, it will result into a change of the status quo. You may also read job analysis templates. Analysis of driving and restraining forces would help a manager or business owner understand key factors affecting employee behavior sch as when someone from the team work without avoiding errors or is not doing his or her tasks right. In this case, the driving forces that you may uncover is the need to keep a job because of economic uncertainty, ambitions of moving up the corporate ladder and the desire to be appreciated or recognized as part of a performing team. The restraining forces might be things such as a workload that’s too heavy and not having enough training. You may also read free gap analysis. If the priority or the change you want to see is behavioral change, driving and restraining forces must be “released”, behavior should be changed in the direction expected or wished and the forces must then be “taken back” so that the desired behavior will continue. In the said situation, the manager can “release” and decrease restraining forces through through the availability of additional training as necessary and by reducing the amount of work to a fair and manageable level. You may also like printable project analysis. General tip: If you’re having challenges in changing the strength of a certain force, you can focus on changing another one since reducing restraining forces is generally more efficient and doable than increasing driving forces. You may also read customer analysis templates. 1. Decide what kind of change you want to see and to be more specific, also include which area in your business you want the change implemented. Write down that vision or goal of a future state that you desire or if you want, you can study and learn to understand the current equilibrium. You may also read financial analysis samples. 2. 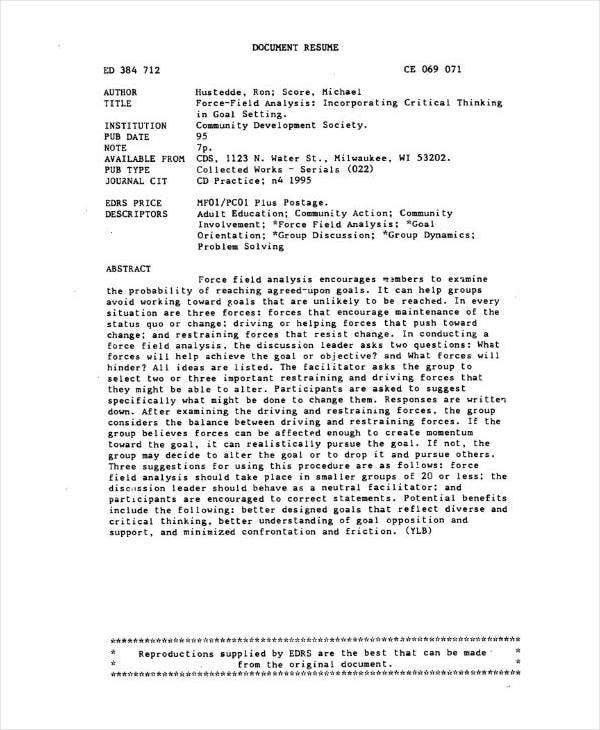 What are the driving forces? Start brainstorming them and also list them down. These are the forces in favor of change and you have to record it as such on a force field diagram. If you don’t have the format for creating the diagram for the analysis, you can download the templates provided in this article. You can also like sample organizational analysis templaets. 3. After mapping out your driving forces, you can now start with the restraining forces. These are the ones that you analyzed to be against or opposing change. As what you have done with the driving forces, record these on the opposite part of the force field diagram. You may also read customer analysis templates. 4. Next, assess both driving and restraining forces. You’ll be able to do this by scoring each force from weak to strong on a scale of 1-5, where 1 is the weakest and 5 is the strongest, then calculate the total for each side or you can leave out and forget about the figures completely and just set your focus on the impact of each of those forces. You may also read business gap analysis templates. 5. Do a review of the forces you have identified. Choose which of these forces are flexible for the change you desire or which ones can be influenced. You may also read requirement analysis templates. 6. What comes next is creating a strategy to increase or strengthen the driving forces. Either that or you can choose to weaken the restraining forces or even do both as necessary or as desired. 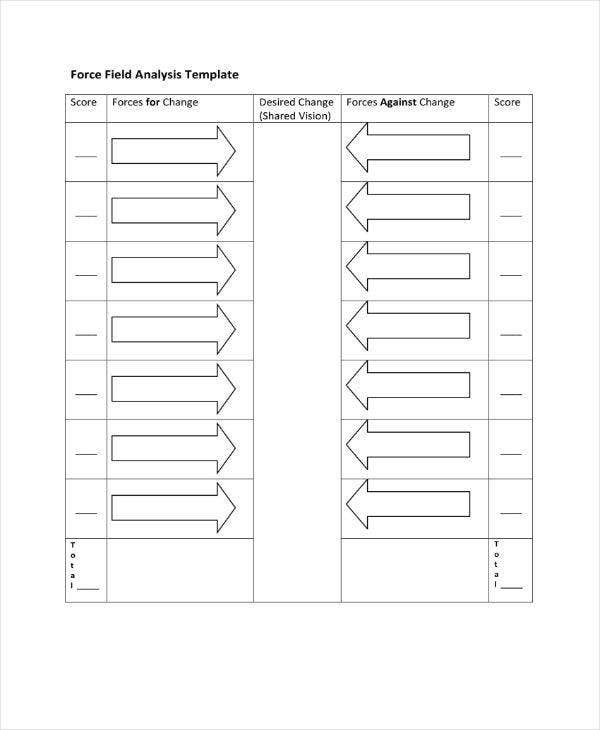 If you have scored each force, how can you raise those ratings for the driving forces or decrease the scores for the restraining forces? How do you plan to achieve both? You can also read sample situation analysis templates. 7. Set priority for action plan. What steps of action can you take to make your decisions better and achieve the best possible impact from the results of your analysis? 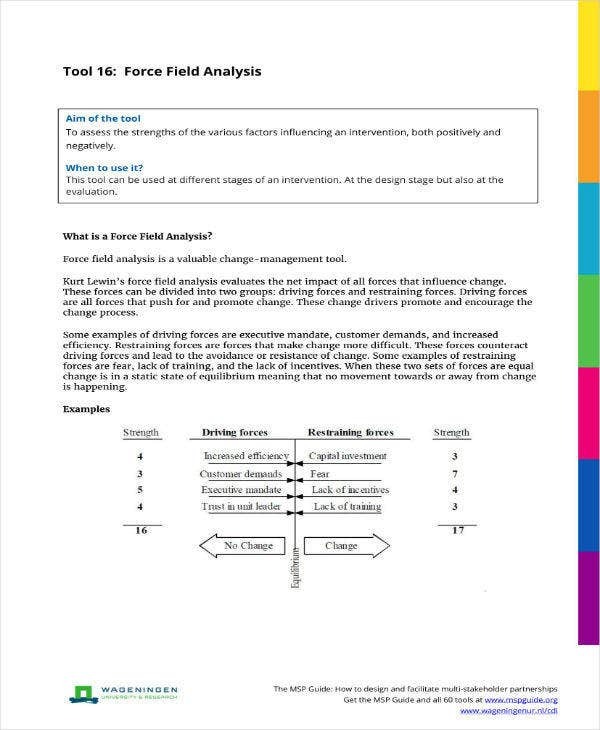 Identify what type of resources are needed and decide how you can implement the plan of action because this all boils down to how force field analysis can be applied and its outcome used for change implementation. 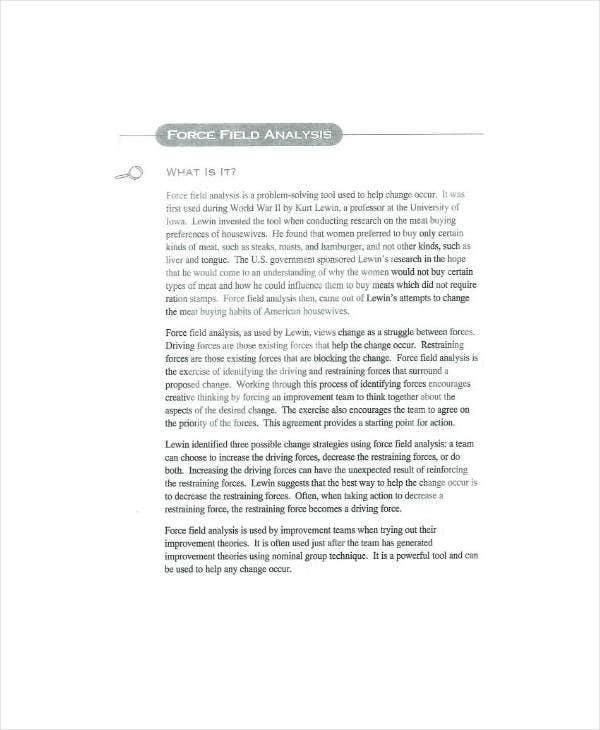 Force field analysis, like other problem-solving and decision-making processes, methods and techniques, have also been met with criticism, usually focusing on the subjectivity of scoring each individual force listed. No matter how popular and useful it is, as other corporate leaders would vouch, without proper implementation and process of doing the analysis, it might not help your organization depending on what you plan to change or achieve. You also have to get the right people to do it, with a proper understanding of how it should be presented, applied and communicated. You can also see poetry analysis templates.